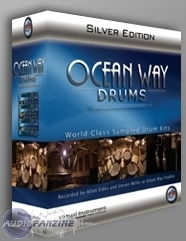 Ocean Way Drums Silver Edition, Virtual Drum/Percussion from Sonic Reality. Sonic Reality and Ocean Way Recording have announced the addition of the Ocean Way Drums Expandable series to their product line of all-in-one virtual drum instruments. Ocean Way Drums Platinum HD and Gold Edition have spawned expandable products that now enable consumers to purchase Ocean Way Drums. 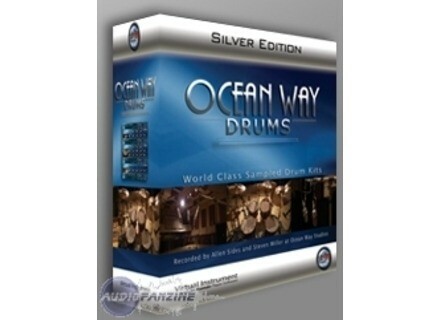 Ocean Way Drums Silver Edition features the 24bit/48k multichannel features of the Gold Edition, but is half the price. It includes 9 Kits with 6 mix presets, and as with all the Ocean Way multichannel products, provides completely variable control of up to 13 discrete sound sources on every instrument. Ocean Way Drums DL is a new 24bit/48k format that pre mixes each instrument within the drum kit to its own stereo fader. It features 5 DL Drum Kits with Dry, Medium and Ambient mix versions - which provide balanced, "record quality" sound. It also includes a FREE Download Card redeemable for 2 additional DL Kits or 1 Multichannel Kit. As both new products are completely expandable and customizable, customers can purchase additional kits and are able to mix and match the Multichannel and DL formats. All 19 Ocean Way Drums Kits and Individual Drums / Cymbals are now available as a' la carte downloads at www.downloadablesoundz.com. Demos for each kit can also be auditioned at www.oceanwaydrums.com. Ocean Way Drums products are all-in-one virtual drum instruments that include the Ocean Way Expandable Player powered by Kontakt. They work with all major DAWS (supports RTAS, VST, Audio Units) and as stand alone software for both Mac OS X and Windows. [NAMM] XT Software Releases energyXT 2.5 XT Software has announced the release of version 2.5 of energyXT for Windows, Mac OS X and Linux. [NAMM] New Pro Tools System Bundles Digidesign is now offering two new Pro Tools LE system bundles: 003 Factory Complete and 003 Rack Factory Complete. [NAMM] Cubase 5 iPod & iPhone App Steinberg showcased the development of a remote controller application for the Apple iPhone and iPod Touch products at Winter NAMM 2009.